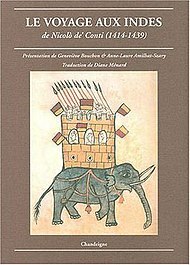 Niccolò de' Conti (1395–1469) was a Venetian merchant and explorer, born in Chioggia, who traveled to India and Southeast Asia, and possibly to Southern China, during the early 15th century. After the return of Marco Polo in 1295, there is no record of Italian traders returning from China until the return of de' Conti by sea in 1439.
de' Conti departed from Venice about 1419 and established himself in Damascus, Syria, where he studied Arabic. Over a period of 25 years, he traveled as a Muslim merchant to numerous places in Asia. His familiarity with the languages and cultures of the Islamic world allowed him to travel to many places, on board ships owned by Islamic merchants. de' Conti's travels followed the period of Timurid relations with Europe. They also occurred around the same time and in the same places as the Chinese expeditions of Admiral Zheng He. His accounts are contemporary, and fairly consistent with those of the Chinese writers who were on Zheng He's ships, such as Ma Huan (writing in 1433) and Fei Xin (writing in about 1436). de' Conti first crossed the desert to reach Baghdad and from there sailed down the Tigris to Basra. He then sailed through the Persian Gulf and went to Iran where he learned Persian. He then crossed the Arabian sea to Cambay, in Gujarat. He travelled in India to "Pacamuria", "Helly" and Vijayanagar, capital of theDeccan before 1555. It was in India that he coined the phrase 'Italian of the East' to refer to the Telugu language, which he found had words ending with vowels, similar to Italian. He went to "Maliapur" on the east coast of India (probably modern-day Mylapore, in Chennai), where he visited the tomb of St. Thomas, who in Christian tradition is recorded to have founded a Christian community there. About 1421, de' Conti crossed to "Pedir" in northern Sumatra, where he spent a year, gaining local knowledge, particularly on the gold and spice trade. (Interestingly, this was the period of fairly intensive contact between Sumatra and China, thanks in particular to the voyages of Zheng He.) He then continued after sailing 16 days to Tenasserim on the Malay peninsula. He then sailed to the mouth of theGanges, visited Burdwan (in West Bengal, India), then went overland to Arakan (in Burma). After traveling through Burma, he left for Javawhere he spent nine months, before going to Champa (in modern Vietnam). de' Conti described South-East Asia as "exceeding all other regions in wealth, culture and magnificence, and abreast of Italy in civilization". In the 1430s he sailed back to India (Quilon, Kochi, Calicut, Cambay) and then to the Middle-East (Socotra, Aden, Berbera in Somalia,Jidda in Egypt), from where he travelled overland via Mt. Sinai, where the Spanish taveller Pedro Tafur encountered him in 1436 and reported some of Niccolò's marvels, including detailed accounts of Prester John, and thence, in company with Pedro, to Cairo. Throughout his travels, he was accompanied by his family. However his wife, whom he had met in India, and two of his four children died in Egypt during an epidemic. He continued to Italy with his remaining children. de' Conti returned to Venice in 1444, where he remained as a respected merchant. Throughout his travels, he presented himself as a Muslim, for security; in Florence he was requested by Pope Eugene IV, as a penance for his seeming apostasy, to relate his travels to the papal secretary Poggio Bracciolini. Poggio's record of de' Conti's account, made in 1444, constitutes one of the best accounts of the East by a 15th-century traveler. It was included in the Book IV of his "De varietate fortunae" ("On the Vicissitudes of Fortune"). Accounts of Niccolò de' Conti's travels, which first circulated in manuscript form, are said to have profoundly influenced the European geographical understanding of the areas around the Indian Ocean during the middle of the 15th century. They were the first accounts to detail the Sunda Islands and Spice Islands since the accounts of Marco Polo, and there is reason to believe that some of the new information on Fra Mauro's map was gleaned from conversation with Niccolò. His accounts probably encouraged the European travels of exploration of the end of the century. The accounts of Niccolò de' Conti influenced the maker of the 1457Genoese map, in the form of geographic conceptions and several quotes and names taken directly from Conti. 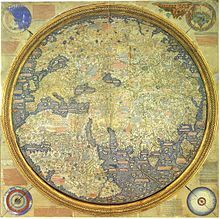 The Fra Mauro map also relied extensively on Conti. They make ships larger than ours, about 2,000 tons in size, with five sails and as many masts. The lower part is made of three decks, so as to better resist storms, which occur frequently. These ships are separated into several compartments, so that if one is touched during a storm, the others remain intact. Also in the time of Eugenius one of them [of Cathay] came to Eugenius, who affirmed their great kindness towards Christians, and I had a long conversation with him on many subjects, about the magnitude of their rivers in length and breath, and on the multitude of cities on the banks of rivers. He said that on one river there were near 200 cities with marble bridges great in length and breadth, and everywhere adorned with columns. This country is worth seeking by the Latins, not only because great wealth may be obtained from it, gold and silver, all sorts of gems, and spices, which never reach us; but also on account of its learned men, philosophers, and expert astrologers, and by what skill and art so powerful and magnificent a province is governed, as well as how their wars are conducted. de' Conti's book was used by several explorers and travel writers, such as Ludovico di Varthema (1510), and Antonio Pigafetta, who traveled around the world with Magellan's expedition. Alfred Russel Wallace cited de' Conti's account of the peoples of Java andSumatra in his 1869 book The Malay Archipelago. The first printed edition of de' Conti's account was made in 1492 in the original Latin by Cristoforo da Bollate and dedicated to Pietro Cara, who was going on a journey to India. Various translations followed, into Portuguese (1502) and Spanish (1503). The first Italian-language edition appears to have been translated from the Portuguese edition, and was made a part of the collection of travellers’ accounts published in 1550 by Giovanni Battista Ramusio. The first English edition was translated from the Spanish, and printed in 1579 by John Frampton, using a combination of Marco Polo's and de Conti's narrations. Jump up^ Leonardo Olschki, "Asiatic Exoticism in Italian Art of the Early Renaissance" The Art Bulletin 26.2 (June 1944), pp. (95–106) p. 103 and note 53, noting M. Longhena, Viaggi in Persia, India e Giava di Niccolò de' Conti (Milan, 1929). Jump up^ Pedro Tafur, Andanças e viajes. Jump up^ It was first translated into English in J.W. Jones, The Travels of Nicolò Conte [sic] in the East in the Early Part of the Fifteenth Century Hakluyt Society xxii (London, 1857). Jump up^ G. Crone, Maps and Their Makers (New York, 19553), p. 59. Jump up^ Wallace, Alfred Russel (1869). The Malay Archipelago: The land of the orang-utan, and the bird of paradise. A narrative of travel, with sketches of man and nature (1 ed.). Macmillan. p. 444. Bracciolini, Poggio: De varietate fortunae, book iv [c.1445] (ed. by Abbé Oliva, Paris 1723).